At Firepit-online.com you’ll find a wide range of accessories. 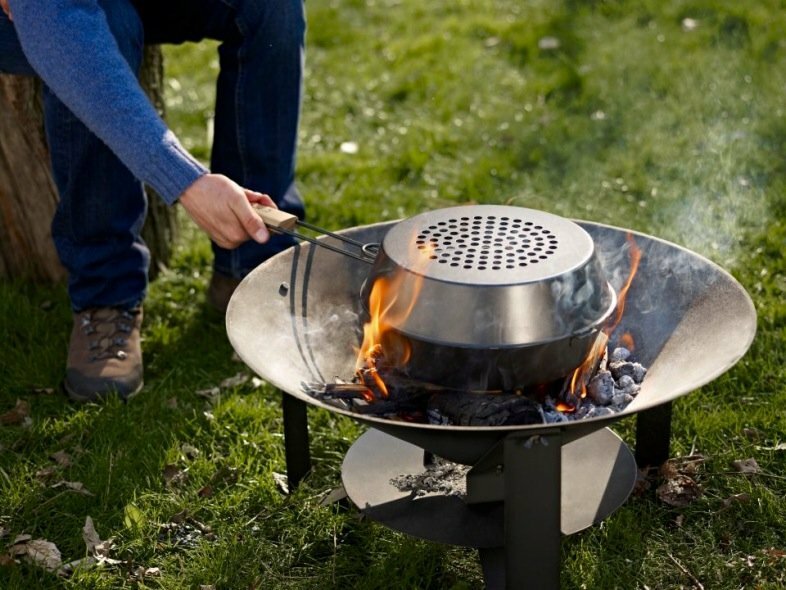 From traditional log lifters to popcorn pans and stock pots so you can enjoy cooking around the fire pit or fire bowl with the kids. A wide selection with something special for everyone. Of course, all created with an eye for detail and with the familiar quality you would expect from Firepit-online.com. Are you looking for practical accessories for your outdoor fireplace, fire pit or fire bowl? Firepit-online.com has a huge range of great accessories for creating atmosphere in the garden. Our product range varies from hip popcorn poppers and cast-iron stew pots to practical barbecue grill grates and practical bottom plates for the fire pit. When you have an attractive patio heater with your lounge set, you will probably want to have all your fireplace tools comfortably within reach. You will, after all, need to put an extra log onto the fire every now and then to fire things up. In addition to the old-fashioned bellows, Firepit-online.com also sells various nice fireplace sets. You can come to us for an authentic 3-piece cast-iron fireplace set or a modern stainless steel fireplace tool set There is something for everyone. In addition, we have practical fire log bags that allow you to very easily collect your firewood. You can simply place this decorative bag next to the outdoor fireplace. Practical and a joy to the eye. We also have several nice accessories for your fire pit or fire bowl in our assortment. The bottom tray for the fire pit, for example, is particularly practical. You place the tray underneath your fire pit or fire bowl and your terrace tiles or grass will be protected from the heat and sparks. In addition, the ash falling from the fire pit can easily be cleaned up afterwards. We call the bottom tray the ashtray for a reason... You can simply empty the plate in the bin. But in addition to the practical accessories we also have a lot of items that simply contribute to a cosy get-together. How about roasting marshmallows over a fire pit in winter, making popcorn with the kids in a popcorn pan, or outdoor cooking in a beautiful cast-iron stew pot? We have it all! Our best selling product is perhaps a barbecue grill for a fire bowl or a grill grate for a fire pit. You can easily add these to your order. In a very simple way, these items will add so much more fun to the experience! Feel free to check out our full product range. And if you have any questions, we are happy to help you!